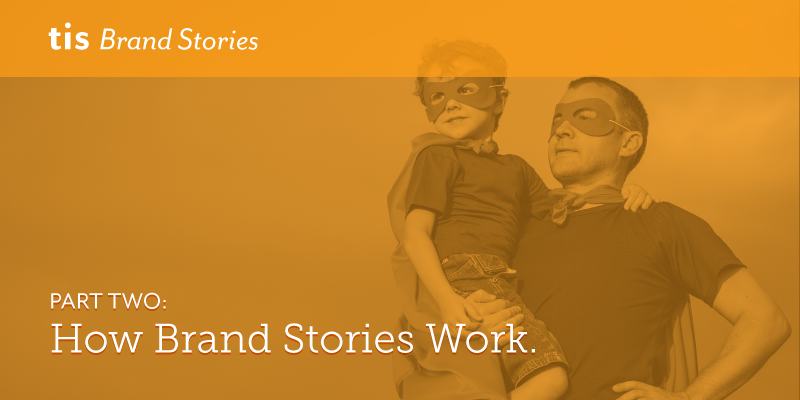 Last week, we talked about why you need a brand story. This week, we’ll talk about how they work. What’s the secret sauce to building a compelling brand narrative? To answer that, let’s lay a little foundation in psychology and neuroscience. I believe that the human brain is hardwired to process information as narrative. As we gather data, our conscious and subconscious organize it as a story, which helps us make sense of the information and frames our experience. Is it the neighbor, letting her dog out to do its business? She’s done that before, she’s a nice lady, the dog is getting old, etc. You also heard a story about a coworker getting robbed last week, and your mind starts trying to connect the dots. Your other neighbor has a son home from college, it’s Saturday night, so maybe he had friends over for a party. See what you did there? Your brain—without much conscious thought—began to organize the information in a way that framed the narrative so that it made sense of your own experience. It answered two important questions: What does this have to do with me? How should I feel about it? Narrative, or Story with a capital “S,” is an elemental force in the human consciousness. Like fire, it’s neither good nor bad—just powerful. It can be put to use for good or evil. Imagine a product that is so stimulating it causes users to obsess over it, crowding out healthy activities and relationships. Imagine this product is addictive, creating neural pathways that crave more and more of a diminishing high. Imagine that this product is expensive, making it harder for you to meet your responsibilities. You can probably think of all sorts of legitimate products like that. If I was hired to work on that brand, I sure wouldn’t sell it on its features. Consuming! Addictive! Expensive! Instead, I’d construct a narrative that suggestively and positively framed the user’s experience. The story would need a hero—and that’s not this evil product, but the user. The story needs conflict and villains. I’d build a narrative around all the forces (people, obligations, conventional society, etc.) that want to keep the hero from being happy and fulfilled, following his bliss. The story needs an arc. I’d build it around how this product sets the hero free from the shackles of people, responsibilities and cultural expectations. Yep, you heard me right: tasked with selling a product that took over users’ lives, leaving them less healthy and poorer, the smart play would be to frame the brand narrative around freedom. And that’s exactly how those sorts of products are sold—because it works. Consumers willingly enslave themselves because they’ve bought into a narrative that positions it as liberation. As your brand ally, we organize the data about your product as a narrative that frames the user experience. But at The Image Shoppe, we’re committed to using this power for good. That’s why we’re a certified B Corp, and why we choose to work to build brands for products and services that contribute to the genuine benefit of people and the betterment of society. So, how do brand stories work? Like all stories, they need a protagonist or hero. That’s never the product or company, but the consumer. And this is key: consumers must be framed as they want to see themselves, not as they actually are. Their experience must be framed as a struggle against something because every story needs conflict. That’s not always a pain point—every day we buy stuff that doesn’t alleviate pain, but it does help us resolve perceived struggles in our lives. The difference is subtle but critical. And the product or service must be positioned in the story arc so that it helps the hero resolve the conflict. Building a brand story isn’t science, it’s art. Enlist The Image Shoppe as your brand ally, and we’ll show you how it's done.